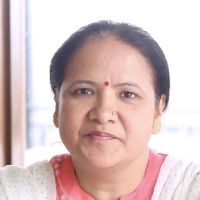 Sangeeta Rawat was born and brought up in Dehradun, where she did her schooling and later did her graduation and post graduation from Garhwal University. She took up Hindi Teaching in 1999 and taught in Scholars Home Senior Secondary School till 2016. There are several languages spoken in this world, one of them being Hindi. It is one of the most spoken languages in this world. Hindi teaching for an Indian is a great pride and gives a sense of immense satisfaction. It includes the complete knowledge of the Hindi language, where one can read, write and speak it. While teachig Hindi, both Hindi Grammar and Hindi Literature are taught. "I was born and brought up in Dehradun. This is where I did my schooling from Shri Guru Nanak Academy. I then did my M A and B Ed from Garhwal University. I have been teaching Hindi from 1999 to 2016. I taught Hindi in Asian School and Scholar's Home Senior Secondary School"